A patio deck on a residential property can add financial value to the home, as well as provide a comfortable space for outdoor relaxation. Homeowners in Ohio who want to build patio decks on their properties must first know the zoning and residential building codes in their communities. The state of Ohio does not have specific codes; most counties or cities have their own rules for building decks; some do not have any at all. Whether you hire a contractor or build the deck yourself, contact township, city or county officials to determine the requirements of the project. Patio decks provide areas for outdoor relaxation. Most communities in Ohio require permits for building decks onto new and existing homes. Applicants must submit property plot plans (which show the house and deck location) as well as drawings of the deck layout, post location, footing sizes and support beams. Plans should be drawn to scale, show all dimensions and connections and provide details for handrails, guardrails, steps and other structures built on the property. Your township or municipality may also require a zoning permit. 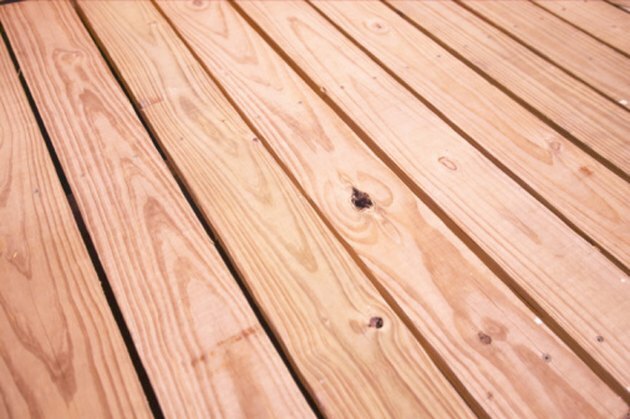 Wooden decks must be built with pressure-treated lumber. The deck's frame structure must be of pressure-treated lumber. Metal hardware such as connectors and fasteners must be of stainless steel or treated with galvanized coating (type 304 or 316 or an equivalent). In the city of Lancaster (Fairfield county) for example, fasteners and connectors must be made of the same material, to assure compatibility. The city requires concrete to secure footings and post holes. Floor joists must span the deck's size and design. In the city of Akron (Summit county) for example, the ends of each joist bearing or girder should overlap the wood or metal of the adjoining piece. Framing anchors must support the joists into the sides of wood girders. Guardrails are required for decks that are 30 inches or more off the ground. A deck with four or more steps should have handrails. Steps may have height requirements. Specific information is available from your local municipality. Inspections must take place before, during and after deck installation. First, before any concrete is poured, post holes are inspected for their soil and footing foundation. Next is a structural or framing inspection; needed for decks that have joists 36 inches above the ground. The frame must be inspected before the floor boards are laid or the guardrails installed. Government building officials will provide a final inspection after the deck is complete. Check with your city or county to determine a specific inspection schedule and requirements for your area.